Operation Rolling Thunder was the title of a gradual and sustained U.S. 2nd Air Division (later Seventh Air Force), U.S. Navy, and Republic of Vietnam Air Force (VNAF) aerial bombardment campaign conducted against the Democratic Republic of Vietnam (North Vietnam) from 2 March 1965 until 1 November 1968, during the Vietnam War. The four objectives of the operation, (which evolved over time) were: To bolster the sagging morale of the Saigon regime in the Republic of Vietnam; To convince North Vietnam to cease its support for the communist insurgency in South Vietnam; To destroy North Vietnam's transportation system, industrial base, and air defenses; and to interdict the flow of men and material into South Vietnam. Attainment of these objectives was made difficult by both the restraints imposed upon the U.S and its allies by Cold War exigencies and by the military aid and assistance received by North Vietnam from its communist allies, the Soviet Union and the People's Republic of China (PRC). The operation became the most intense air/ground battle waged during the Cold War period, indeed, it was the most difficult such campaign fought by the U.S. Air Force since the aerial bombardment of Nazi Germany during World War II. Thanks to the efforts of its allies, North Vietnam fielded a potent mixture of sophisticated air-to-air and ground-to-air weapons that created one of the most effective air defense environments ever faced by American military aviators. After one of the longest aerial campaigns ever conducted by any nation, Rolling Thunder was terminated as a strategic failure in late 1968 having achieved none of its objectives. Operation Rolling Thunder was given government approval and officially started on February 24th 1965 though the first attack did not occur until March 2nd when 100 US and VNAF planes attacked an ammunition base at Xom Bang. The bombing campaign lasted until October 1968, despite the fact that it was meant to have been no more than an eight-week campaign. The execution of the operation was blurred from the start. The US Air Force was restricted as to what it could bomb out of fear of provoking a Soviet/Chinese response. Whereas the US military wanted a bombing campaign that had clear military results (such as severely limiting the way the NLF could operate in South Vietnam) the ‘hawks’ in Washington DC wanted to demonstrate to the North Vietnamese government the awesome military power the US could muster – a military power that the North could not hope to match. The failure of Operation Thunder to undermine the government of Ho Chi Minh in its first few weeks led to a change of strategy. By the end of 1965, the bombing raids were used against the supply lines that the North used into the South as opposed to specific targets in the North itself. However, Haiphong and Hanoi remained targets. One of the results of the opening phase of the operation was that Vietcong forces attacked US air bases in South Vietnam. General Westmoreland told Washington that he could not defend these bases with just the 23,000 men that were under his command. Westmoreland claimed that unless he received more troops, the Vietcong would overrun these air bases. As a result, President Johnson ordered the sending of 3,500 US Marines to South Vietnam – the first official troops to be sent there. 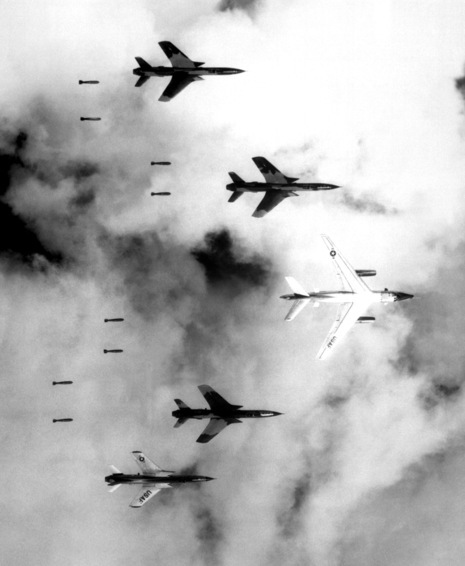 During the many months during which Operation Rolling Thunder operated, 643,000 tons of bombs were dropped. However, nearly 900 US aircraft were lost. The financial cost of Operation Rolling Thunder was huge. It was estimated that the damage done to North Vietnam by the bombing raids was $300 million. However, the cost to the US of these raids was estimated at $900 million. Operation Rolling Thunder ended when President Johnson offered its termination as a way of securing the North Vietnamese to a negotiating table. Peace talks began in earnest in January 1969 just two months after Johnson ordered the ending of Operation Rolling Thunder.